This second-generation 9700-series processing element for modular sound synthesizers is designed to provide great sound and excellent value. This module is designed to be compatible with most modular synthesizer systems with little or no modification. Most active components are already mounted, making assembly a snap. 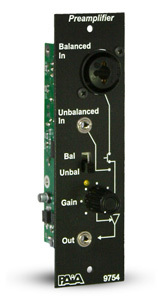 The 9754 is used to match low-level signals such as those from microphones to the line-level (plus) signals anticipated by modern modular synthesizers, or, just to perform a general signal boost. Inputs to the module may be balanced or unbalanced (two or three circuits), via XLR plugs, 1/4" phone plugs, or 1/8" phone plugs (tip-sleeve phone, aka 3.5mm mono). An on-board regulated +12V DC or an optional externally-supplied voltage can be selected as an output power source for phantom-powered microphones. The module has an adjustable gain control (to x1000) and an unbalanced 1/8" phone connector output. To purchase the assembled module, click the 9754ASM product page.